With Animated Screensaver Maker you can beautify your desktop with an unlimited number of animated screensavers with amazing effects. You can create as many screensavers as you have photos. It’s very easy. You need only three mouse clicks to create a new screensaver. 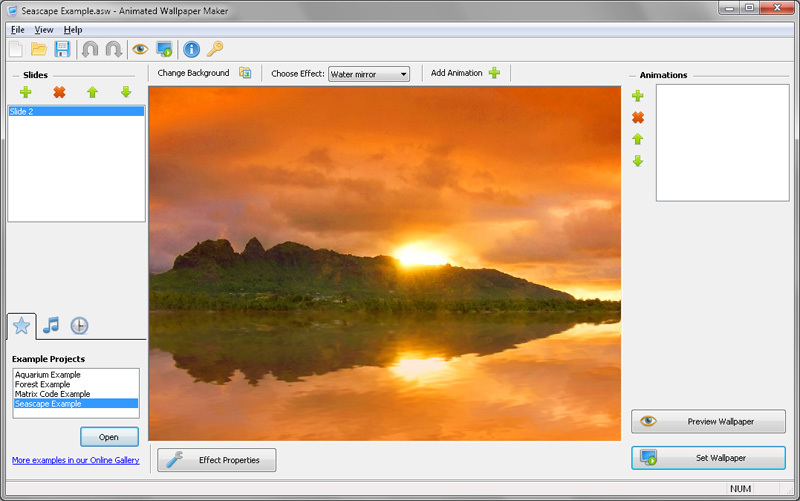 Just load your picture into the tool, adjust animation parameters and click the button to build a screensaver. You can animate any picture you have. In addition, a large art collection is available for Animated Screensaver Maker. It contains more than 50 animated screensaver projects in six categories: sunsets, lakes, mountains, ice, cities & buildings, and animals. You can use them both as screensavers and wallpapers.